VPN or a Virtual Private Network is a common way of securing an Internet connection using encryption. Basically a VPN sets a trusted, designated server on the Internet to act as a man in the middle. As a VPN client, all your web traffic gets encrypted and directed to this designated machine. It decrypts and then reroutes the traffic to its intended destination. This gives you a both benefits and disadvantages. Having an encrypted connection between yourself and a trusted VPN server means your Internet traffic is mostly safe from snoopers. That could be anyone on the same Wi-Fi network as you, your ISP or even big-brother governments. If you are behind a government or corporate firewall, the VPN could be used to reach blacklisted websites. As the firewall will only see that your traffic is directed to the designated VPN server. A VPN also allows you to hide the point of origin of your Internet request from your destination. As the designated server intercepts and decrypts your Internet traffic before it resents it. This fools the destination to believe the Internet request came from the designated server and not from you. If a website or service has region restrictions placed on it to allow only users from particular countries access. A VPN server hosted in a permitted country allows you to bypass this form of restriction. The most obvious disadvantage in using a VPN server is that adding an extra layer of Internet bureaucracy slows down your overall Internet experience. The encryption requires more processing time and it consumes more bandwidth. Plus adding a man the middle means your Internet traffic isn’t going to be traversing across the Internet via the quickest possible route. For this project I am going to carry out a VPN client connection on a Raspberry Pi without using any GUI tools. This could be used with a headless or server Raspbian Pi set-up. It should also work fine on a Ubuntu based Linux system. Also this tutorial will use the most common VPN protocol PPTP, known as the Point-to-Point Tunnelling Protocol. Its encryption is not as secure or as safe as some other VPN options but it is the most supported of the protocols out there. First in a Pi shell we need to update our repositories, our Pi operating system and install PPTP for Linux. 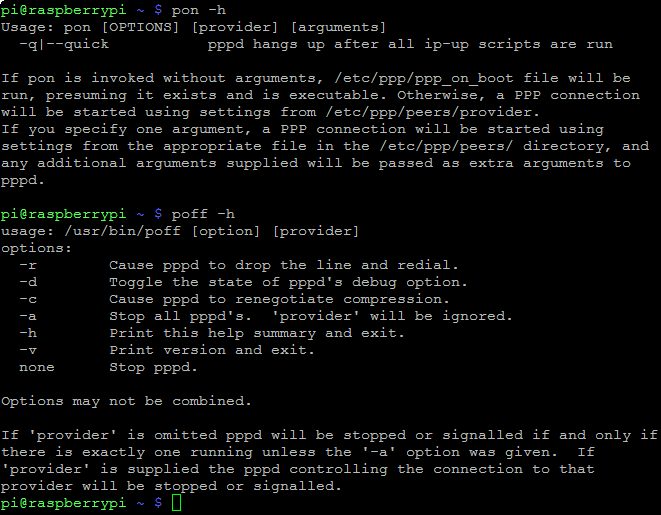 The pptp-linux installation includes the very useful Perl script pptpsetup that is found at /usr/sbin/pptpsetup. List the help options for pptpsetup. pptpsetup has 6 options to create a PPTP connection configuration. The --create option is the ‘tunnel’ name you wish to give your connection. It can not have spaces or weird characters and should be something that is descriptive of the VPN server it will connect to such as a geographical location. --server Is the address of the VPN server to connect to. --username Is your assigned user name used to authorise access to the VPN server. --password Is the password required by the user name. --encrypt Toggles encryption for all communication between your Pi and the VPN server. While this setting is optional, most VPN servers will not accept a connection unless encryption is in use. --start Will connect to the VPN after creating your new connection configuration. For the rest of this tutorial I will use my real world example of pptpsetup. Replace any references to my proxpnuk configuration with your own VPN server configuration. If you have a Connection termination but you are sure your server address, user name and password are correct, try using the --encrypt option. pptpsetup creates a configuration file that gets placed in /etc/ppp/peers/ which is a superuser protected directory so you will need to run sudo to view its content. You can see your point-to-point protocol connection using ifconfig -s. It should be listed under ppp0. pptpsetup can also be used to delete an existing configuration file. 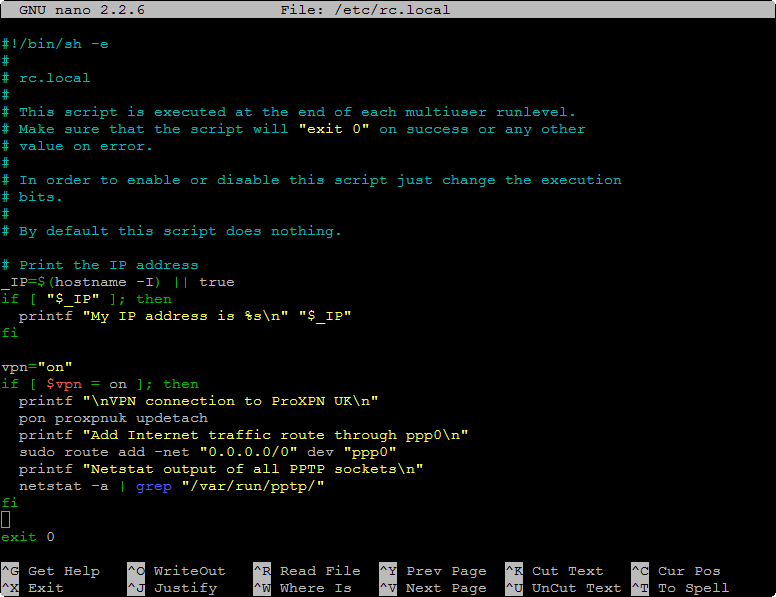 PPTP for Linux also installed two Bash scripts that are used to connect and disconnect to your PPTP VPN server. You can use the -h option to see the scripts help text. If connected let us disconnect our current ppp connection using the poff script. Ifconfig should only list eth0 and lo under the Iface column. To see your connection settings for troubleshooting. To save the debug output to a file and view it. PPTP for Linux has a log file that can also be useful for troubleshooting. It is found at /var/log/messages. The tail command normally displays the last 10 lines of text file but when it’s combined with the -f follow option it displays the most recent text appended to the file. Press [Ctrl] C to exit tail. I use the traceroute command to test for an active VPN connection. First make sure there is no ppp0 connection. 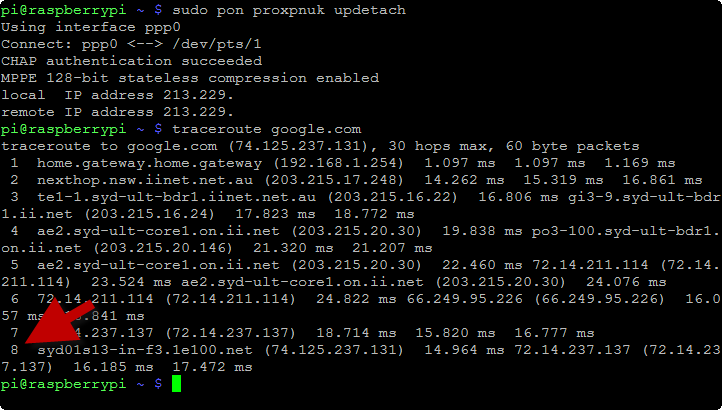 Then run traceroute to a well-known website such as google.com. Make a note of the number of hops. In my case it took 8 hops for a request from my Raspberry Pi to reach Google’s servers. Now if we enable our ppp0 connection and try again, you will probably discover that connecting to Google takes exactly the same number of hops. This probably means the internet traffic sent and received from the Pi is not using our VPN connection. We need to create a route to tunnel our Internet traffic through our VPN. The route command at /bin/route is perfect to carry out this task. The -net 0.0.0.0/0 sets the target network of the route to be the default route. dev toggles a device to reroute our traffic to. While PPP connection number one ppp0 is that device. To check if our route was successful use netstat with the -a all sockets option and feed the output into grep to filter and display only the lines that contain the string "/var/run/pptp/". These lines signify our PPTP routes. Test your connection again and you should have a greater number of hops than last time. That meant the connection to Google.com from your Pi had rerouted through your VPN server. Congratulations. To automatically connect your Pi to a VPN server at start-up I’d recommend placing the following script into /etc/rc.local. This file runs all commands within as a superuser, at the end of a Pi boot but before the user login prompt. I use the -B option with the nano text editor to backup the rc.local file before making any changes to it. Make sure you insert any script before the exit 0 line and after the hashed # comments. printf "\nVPN connection to ProXPN UK\n"
printf "Add Internet traffic route through ppp0\n"
printf "Netstat output of all PPTP sockets\n"
The script is pretty self-explanatory and I have contained it within a conditional statement to disable if needed. To do this simply change the vpn="on" variable to something else such as vpn="off". In nano press the [Ctrl] X keys to prompt for a Save modified buffer? query. Answer Y at the prompt to save and press enter to keep the current File Name to Write. You don’t need to reboot to test your changes to rc.local. Executes the script same way as it would with a reboot. I am happy to reply to any questions about this post but I am no expert on the subject of VPN and can not help in setting up a VPN server or using other client protocols such as OpenVPN. Extracting this information on PPTP for Linux was quite time-consuming. Nope, i’ve figured out to add persist to the end of the line “pon updetach persist” in my rc.local file, and maxfail 0 in the /etc/peers/ file, but it won’t detect a dropped connection, close the connection, then restart it. Yeah i should of better read the post above! Fan-dabby-tastic guide you’ve written here! Quiz-Q for you though, how would you suggest one sets the VPN to keep-alive/auto-redial-on-drop? I’m using this to build a handful of rPIs i’m gonna dot around and would like them all to dial-home, then reconnect if the connection drops (3G for example). I think I have solved the problem, plus an additional one which I did not mention, namely that the VPN connection will disconnect after a while. If I add “persist” and “maxfail0” to the proxpnuk file in peers (look up what this means in the pppd help) then this not only ensures that the connection will stay up, but also will retry any failed initial attempt which was due to the internet connection not being up yet. This effectively deletes the default route and replaces it with one which uses the VPN connection. This works for me anyway. Glad to hear you managed to sort out the problems Geoff and thanks for sharing your solution. Hi Geoff the guide does make the assumption that the Pi was connected to a wired Ethernet connection. I personally have not used Wifi with the Pi so I am not sure what kind of problems maybe encountered when using that. But by the sounds of it you seem to be on the right track and you might need to enable the updetach functionality after the WIFI connection has been made. I am sorry I can not be of more help but I do not have the Pi with me at the moment. You do not want to be deleting any default routes as each internet interface (such as Wifi, ethernet connection 1, ethernet connection 2, etc) needs its own route. ppp0 is used to simulate a point-to-point connection between your Pi and the VPN server but it still needs to share an existing ethernet or wifi interface to gain access to the Internet. in /etc/rc.local. Is it not necessary to delete the default route first? hey ben, I am a complete noob here and am only copying what I see. I have run into 2 problems. 1. kernel does not support PPP filtering – what can be done to solve this? 2. -bash: traceroute: command not found. Hi, Raspbmc seems to be your problem. It’s designed for multimedia and has many of the usual Linux networking tools removed. As a ‘noob’ you’re unfortunately out of luck as Raspbmc does not support VPN. If you need VPN I suggest using Raspbian Linux on your Pi instead. Hi Jose unfortunately there could be an endless list of problems with no obvious solution. The first thing I would check is to make sure your VPN server you’re connecting to is tested and working and the VPN settings saved to the Pi are 100% correct. It seems to me that the solution would be to route predetermine ports to “lo” interface (127.0.0.1), for example the 22 (SSH). I’ve tried to do this with iptables and went on-line and found a script generator for that, but couldn’t get it to work. What do you think, is my logic correct? Or does this seems impossible to do, without a new interface, for example a wlan device? After I’ve activated the ppp I can’t no longer access my linux box from the outside world, only in my home network, do you now how to solve this?